Hunger Is was designed to build awareness and raise funds to eradicate childhood hunger in America. A joint charitable program of EIF and the Albertsons Companies Foundation, Hunger Is directly benefited programs focused on combating childhood hunger and improving health-related outcomes. 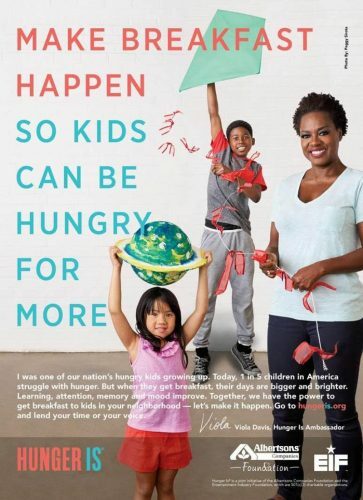 The Hunger Is volunteer celebrity ambassador, Voila Davis, suffered from childhood hunger herself and spoke freely about her personal connection. A PSA Campaign placed between March 2014 and August 2016 generated over 3.9 billion impressions and more than $79 million in donated advertising value.